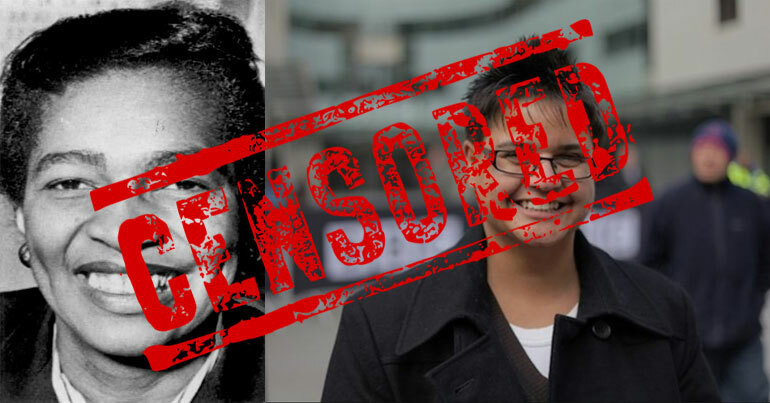 How many privileged columnists does it take to silence one Black woman? I was meant to give the Claudia Jones Memorial Lecture this evening. But instead, a group of privileged columnists at the Guardian and other establishment outlets bottled it. They circled the wagons to ensure that a Black woman didn’t get a platform to speak about another Black woman. But it could not have backfired more spectacularly. Because now, they’ve accidentally created a much bigger platform for the speech they were too afraid to hear. Early this year, the Black Members Council of the National Union of Journalists (NUJ) invited me to give the annual Claudia Jones Memorial Lecture. I was thrilled. Claudia Jones was a radical; Black, feminist, communist, and a journalist. She helped launch the Notting Hill Carnival and founded the West Indian Gazette. To the establishment of 1950s England, everything about her was wrong. Her colour, her gender, her politics. Faced with this closed network of privilege, Claudia built her own platform. And she used it to tell the stories and present the views which Britain’s establishment press would not. Not a million miles from the work that independent outlets like The Canary, the Ferret, Media Diversified and others do today. They don’t pay their journalists! As everyone knows (because we publish it on our website), we actively encourage all of our writers to join and be active in the NUJ. Our team also voted on its own pay deal. The absurd argument that we pay per click only works in the sense that every journalist is paid per click/paper sold, because that’s how every publisher makes their money. Our writers get a flat fee per article based on subscription fees, and a top-up from advertising revenue. As an organisation that started without any outside investment, we have had to earn every penny we pay out to ourselves. Whether we have a great month or an awful month, we share what we earn fairly. This is a very different story to the establishment media, an industry whose bosses routinely bust unions and employ unpaid interns to do the bulk of their work. They employ an antisemite! We don’t. Canary writer Steve Topple publicly recanted his antisemitic views more than a year before working for us. He didn’t delete his tweets or try to pretend it didn’t happen. He owned it. And he continues to do so. The whole point of the antiracism movement is to end up with fewer racists. Steve is a success story, and I’m proud of him for changing. This is routine for us. Whenever we make a significant update or correction to a story, we announce it across all our social media channels with greater prominence than the original. This doesn’t happen in the establishment media. Unfortunately for the Westminster commentators, people got this. Many have supported us from the start; they’ve followed the growth of The Canary over the last three years and know it’s a very different beast today. We are independently regulated, we have an editorial team of six, a five-stage editorial process, and our articles are written and edited by press-carded, unionised journalists. 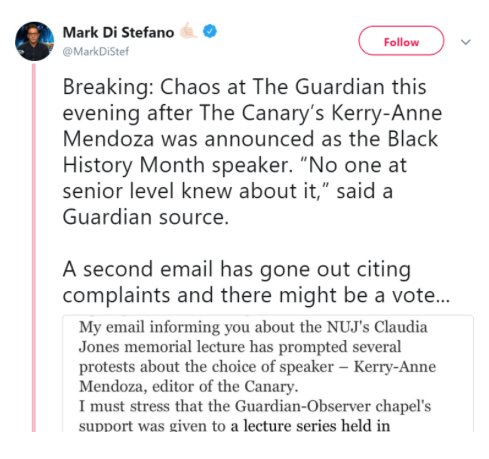 We are a professional outlet that reached more people online in the run-up to the 2017 general election than Reuters, New Statesman, the Economist, the Spectator, the Times and other wealthy, long-established outlets.
.@TheMendozaWoman is a worthy choice to deliver the Claudia Jones memorial lecture. Next, they tried to force me to step down. They targeted me on social media, like a little gang. The lecture was no longer about Claudia Jones or the Black Members Council that founded the lecture in her name. Now, it was the Guardian‘s event. This is what tokenism looks like. Wealthy liberals hijacking the history of radical leftists while demonising radical, left voices in their own time. They held a vote to reject me as speaker. Unfortunately for them, NUJ officers pointed out this wasn’t within their jurisdiction. 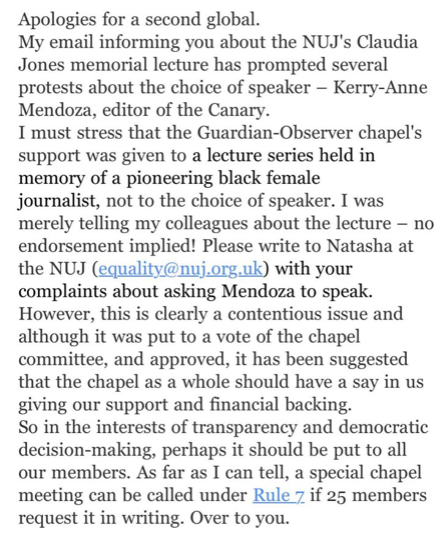 The NUJ Black Members Council chooses the speaker for the Claudia Jones Memorial Lecture, not Guardian writers. Faced with the lone option to reject the event altogether, they voted in favour of hosting the event. When that didn’t work, they threw up a bunch of bogus headlines that I was ‘breaking the Guardian boycott’. But we knew from reactions in the meeting that it wouldn’t stop there. And it didn’t. Next, they concocted a fresh smear in order to put pressure on the NUJ to pull the event. 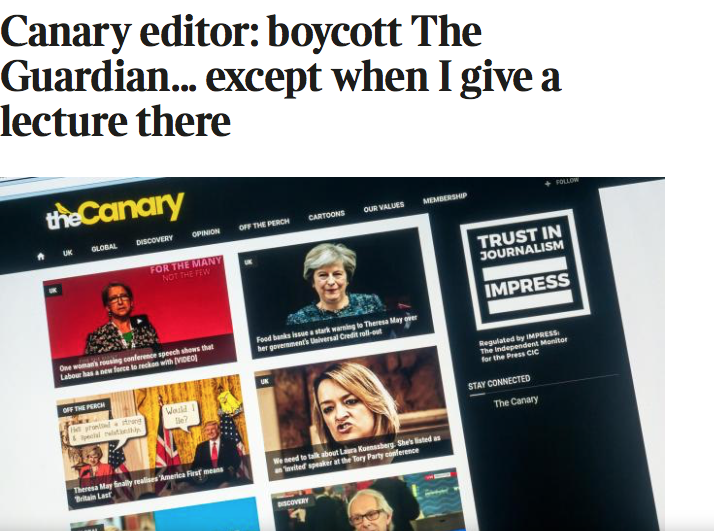 Suddenly, The Canary was apparently responsible for ‘endangering a journalist’. Criticism centred on a report by award-winning journalist Max Blumenthal which pointed to a number of issues with reporting by the Guardian‘s Carl David Goette-Luciak in Nicaragua. Interestingly, this charge was led once more by Mark Di Stefano of BuzzFeed. His story connected our one article on Goette-Luciak with an online doxxing of him. 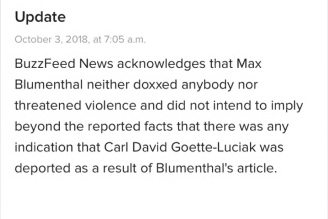 No evidence of the link was made, and there was no effort to challenge the factual basis of Blumenthal’s report. It was a straight smear. One thing reported on top of the other as if the link was obvious. By 7am the next morning, BuzzFeed was forced to retract the accusation. But it didn’t have the integrity to pull the story or post a prominent correction. Instead, it added this ‘update’ at the bottom. It considers it an ‘update’ to say ‘although we spend this entire article insinuating a link between these two things, there is actually no link between the two things’. Whatever that is, it’s not journalism. NUJ general secretary Michelle Stanistreet then pulled the lecture from the Guardian building. Di Stefano tweeted a quote from her which indirectly condemned us for the false allegations BuzzFeed had already retracted. Di Stefano then announced the cancellation on Twitter, before any of us had been informed. He failed to mention, however, that his own site had been forced to row back on the smear that triggered the cancellation. The irony here is that these columnists are guilty of their own charge. 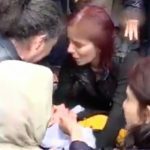 They began a campaign of harassment against a fellow journalist. They knowingly promoted the smear which had already been rowed back on by the outlet that had made it. And they did so in a cynical attempt to no-platform a Black woman journalist. It also fills me with a peculiar kind of horror that this was enabled by the general secretary of my own union. 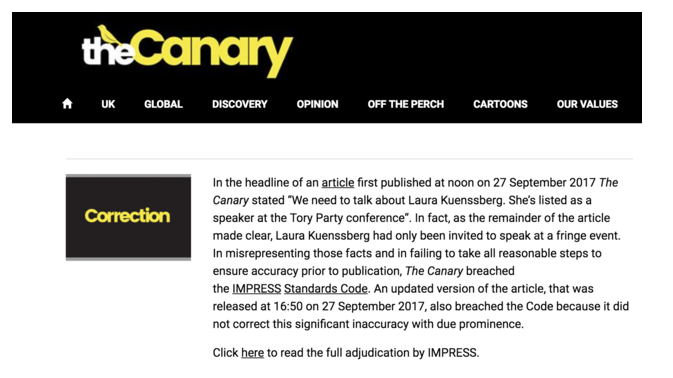 On Friday 12 October, the NUJ is meeting to discuss the allegations against The Canary; allegations which have already been publicly retracted by the outlet that made them. Stanistreet has overruled the will of the Black Members Council. And she did so on the word of BuzzFeed; an organisation that worked hard to ensure its own workers remain un-unionised. And so my lecture will happen at another location, on a different day, and it will be streamed around the world. Instead of a small tribute to Claudia Jones, it will be a rallying cry for everyone who is tired of the morally bankrupt establishment media. For the columnist class, this was never about Claudia Jones, or me, or The Canary. It was about a handful of obscenely privileged Westminster columnists ganging up to avoid being embarrassed. They didn’t want to have to sit and grimace while their industry was criticised from the outside. And they resorted to lies, smears and confected outrage to avoid it. They placed themselves on the wrong side of history and exposed their paternalistic, classist, racist attitudes to the world. So I’d like to thank each of them for screwing this up so badly. Because this speech is made all the more important and poignant by the attempts to shut it down. How many privileged columnists does it take to silence one Black woman? Trick question. They never have, and they never will.